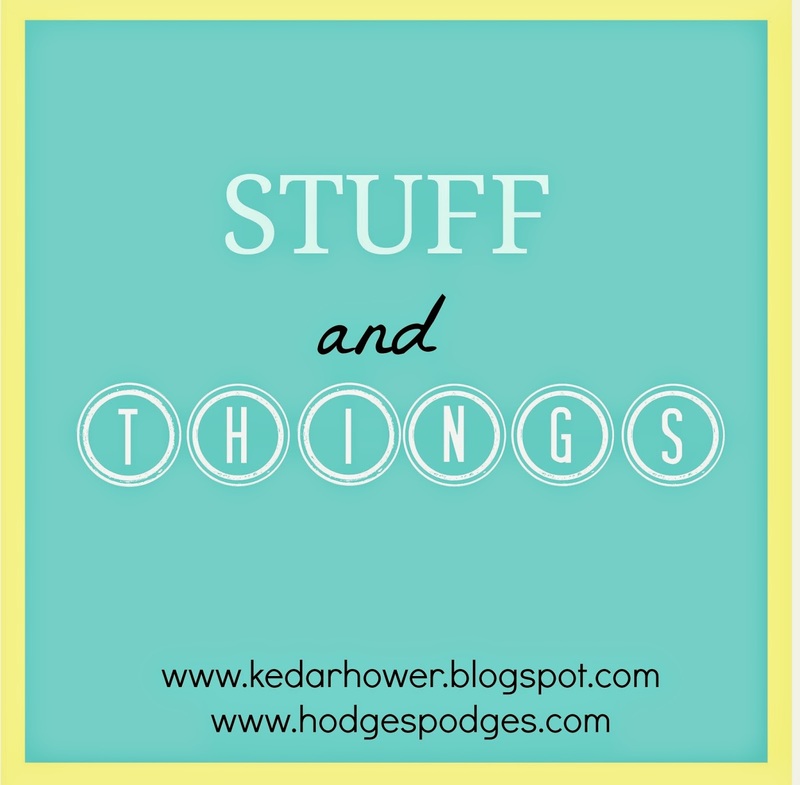 I'm so excited to have Joey from Hodges Podges join me for Stuff and Things. She's one of the two bloggers who have my phone number, so I trust her with my beloved link-up. I figure this way, if I have a mishap like I did last week, at least the link-up will be on somewhere in blogland. Plus, Joey is fun and I love her blog. +Also, I almost threw up when I watched the end of TWD on Sunday. +I started watching Don't Trust the B last weekend. It's okay. I mean, it creates background noise, which is what I use t.v. for most days. Pickings are often slim on Netflix. James Van der Beek is pretty funny. I've never seen Dawson's Creek. Maybe that can be this coming weekend's project while I paint more cabinets? I'm not crazy about Krysten Ritter. I was happy when they wrote her off of Breaking Bad. This show is what I would call the poor man's version of New Girl. I understand why it was canceled. +I almost always insist on italicizing the names of t.v. shows or books. It is quite possibly the only type A thing about me when it comes to blogging. +My biggest dilemma this week: this is the time of year when I like to pull out all the fancy PowerPoints I made awhile back to teach the kids about anti-Columbus Day, Halloween, Thanksgiving, etc. Unfortunately, I had all this on a jump drive that is now defunct (i.e. it won't work because it's 10 years old) and the only other place I have these things saved is on my old Toshiba laptop. Scott has an old Toshiba laptop too and his power cord broke about a year ago. Since I don't use my Toshiba anymore, I gave him my power cord. Scott is in Texas. With his Toshiba. And the power cord. I can't get into my old Toshiba because it's been in a box since we left Alaska and needs to be charged and I don't have a power cord. Which means all of my PowerPoints are lost to me for now. And my dilemma is: Do I create more? Or do I wait it out and the kids get an anti-Columbus Day lesson in November? I can't figure out if this is a laziness thing or just a practicality thing. I have the weekend to decide. I really don't want to spend my weekend making powerpoints. +Yesterday, I ended up at Jersey Mike's trying to order a wrap for lunch because I had a training in that part of town and the only other places were McDonald's and Taco Bell. Jersey Mike's is definitely no Jimmy John's but it's also not the worst thing in the world. So I ordered a grilled veggie wrap and I swear they forgot about me. There were like 7 people working behind the counter and it still took over 10 minutes. 10 minutes might not seem like a long time to wait for food, but this was a sandwich shop. I didn't even complain, but they knew they were being a-holes so they give me a coupon for a free meal and mumble, "sorry", in the quietest way possible. This wasn't the first time either, so why I went back I'm not actually sure. The things I'll do to avoid fried fast food…. +Lastly, I admit it. I'm basic. So basic. And I'm okay with that. However, I have never ever ever had a pumpkin spice latte. Yesterday, at Starbucks (a basic destination) I had an Americano with a splash of cream (not a basic drink). So there. Watch this video. Hi! Stopping by on the linkup for the first time today! I've been following Joey for my whole blogging career... all of 2 months! But from one teacher to another... just wait on the PowerPoints. They'll still learn something even if it's out of sequence. Spend your weekend doing anything but work!! The PSL is not worth it! It is too grossly sweet. I'm impatient. I'd be all "I'm getting another laptop power cord." I don't watch the walking dead or don't trust the b.. but how have you not watched dawsons? eeep! lol it was a huge part of my teenage-hood. YAY for co-hosting!! I'm with Claire on the power points--don't spend your weekend working if you already have the stuff and can get access to them later. Are there any toshibas at the school that you could gank (my made up word for steal) a power cord from for a night? I'm not a fan of the pumpkin spice latte (I think all of blogland just gasped). I went to a coffee shop last week and my friend ordered an americano and said I really need to try it!! I always had problems ordering food from Jersey Mike's. PSL's are seriously overrated. I mean, the "light" version or whatever is decent, but not my drink of choice (I'm talking like I have a Starbucks nearby, hhahahahahhahahahahahhahahah). If you want something good, though...get a double tall Americano with a pump of pumpkin syrup. It's not very sweet and it still very much tastes like coffee instead of candy. Or do you not like pumpkin? Now I can't remember. I didn't even know what exactly was happening at the end of last weekend's episode but it made me gag, ha! Oh well that's what zombies are for. haha I'm pretty sure I'm "basic" too and you know what? IDGAF! The end of TWD was crazy! I mean, I guess I knew that would happen, but I didn't see it going down like that. I'm definitely back on board with this season though. Last season I was ready to quit. P.S. Can you let me know if this comment came up as no-reply? I'm trying to find a work-friendly way of commenting since Blogger is blocked and for some reason OpenID won't recognize my username anymore. .